Kelser's Andrew Tyler was interviewed by WFSB Channel 3 Eyewitness News at the Travelers Championship about providing IT for the tournament for over 20 years. Working in conjunction with vendors who wire and connect the course, Kelser provides the IT for the tournament staff, volunteers, ticketing, scoring and more. The Rob Dibble Show on 97.9 ESPN Radio interviewed Kelser's Andrew Tyler about how the technology that runs the tournament has evolved over the 20+ years Kelser has been involved. They discussed what it takes to run reliable state-of-the-art IT for hundreds of people in an outdoor, temporary location, and Andrew offered a perspective on how the tournament has grown and evolved, describing how he helped the tournament transition to digital in the late '90s. Kelser has worked with Hoffman Auto Group to update and optimize many of their systems, including cybersecurity. 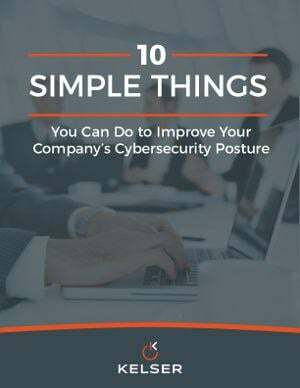 One of the last pieces to address for the well-known Connecticut auto dealer was cybersecurity awareness for its employees. In a story on their evening news, New Haven-based ABC affiliate WTNH showed how Kelser created a very convincing phishing email from a Hoffman executive to simulate a cyber attack on employees. Good Morning Connecticut on WTNH had Kelser COO & CTO Jonathan Stone on with Halloran & Sage Partner Jay Arcata to unpack the Facebook data breach and offer predictions and tips for users. The segment, as well as additional thoughts from Jon and Jay, can be viewed on our blog. Heading into tax season, Kelser Vice President of Professional Services Matt Kozloski and Commissioner of the Connecticut Department of Consumer Protection Michelle H. Seagull appeared on WTNH's Good Morning Connecticut and the MetroHartford Alliance's "Pulse of the Region" radio show to talk about tax scams and how businesses can avoid them. Kelser COO & CTO Jonathan Stone was quoted in an article about Wi-Fi security for Inc.com sponsored by Comcast Business. The article explores the different types of wi-fi hacks in detail and recounts how Kelser has been known to demonstrate how "evil twin" attacks work by setting up our own fake networks at conferences and then revealing them to attendees. The February issue of Connecticut Magazine includes a photo of Kelser CEO and President Barry Kelly with Dr. John Votto, left, former president and current board member of the Hospital for Special Care in New Britain at our Kelser Charity Challenge golf tournament last fall. The event raised $17,500 for the Hospital for Special Care.